Trench maintenance problems are caused by improper backfill placement and construction procedures. This report is part of a multiphase research project that aims to improve long-term performance of utility cut restoration trenches. The goal of this research is to improve pavement patch life and reduce the maintenance of the repaired areas. 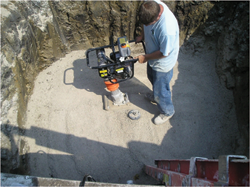 The objectives were to use field-testing data, laboratory-testing data, and long-term monitoring (elevation survey and falling weight deflectometer testing) to suggest and modify recommendations from Phase I and to identify the principles of trench subsurface settlement and load distribution in utility cut restoration areas by using instrumented trenches. The objectives were accomplished by monitoring local agency utility construction from Phase I, constructing and monitoring the recommended trenches from Phase I, and instrumenting trenches to monitor changes in temperature, pressure, moisture content, and settlement as a function of time to determine the influences of seasonal changes on the utility cut performance.